Obituary for Joan B. (Witmer) Young | Harold M. Zimmerman And Son Funeral Home Inc.
Joan B. (Witmer) Young, age 84 of Greencastle, PA passed peacefully in her sleep at her home of 60 years on Friday evening February 8, 2019. Born January 1, 1935 in Greencastle, PA, she was the daughter of the late Clarence W. Witmer Sr. and Mary E. (Lindsay) Witmer. She married her husband Robert M. Young on September 10, 1955. Joan was a homemaker most of her life but in her younger days worked at several factories. After her children left home, she worked as a cook at different local restaurants. She was of the Christian faith. Joan’s interests and hobbies included camping at the river, bird watching, doing puzzles, singing, listening to music, and being with her family. 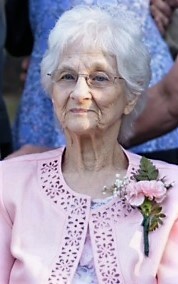 She was an excellent baker and over the years won 64 ribbons from various entries in the Franklin County Fair. She was a kind and loving mother to 8 children who thought she was the best mother in the world. Surviving family in addition to her husband of over 63 years are, six daughters, Diana Traver (Francis) of Greencastle, PA, Cynthia Miller (Harry Gsell) of St. Thomas, PA, Mary Starliper (Rodney) of Chambersburg, PA, Christina Fignar (Joseph), Ft Loudon, PA, Barbara Heister (Philip) of Greencastle, PA, Maria Monninger of Greencastle, PA; two sons, William Young (Joanne) of Wenatchee, WA, Tom Young of Greencastle, PA, 24 grandchildren, 24 great-grandchildren; six brothers, Clarence W. Witmer, Jr. of Greencastle, PA; Richard D. Witmer of Chambersburg, PA; Lowell T. Witmer of Greencastle, PA, Robert D. Witmer of Greencastle, PA, Glen A. Witmer of Marion, PA, Henry L. Witmer of Melbourne, FL and one sister, Mary E. Gsell of Shippensburg, PA. In addition to her parents, she was preceded in death by one brother Leonard Eugene Witmer, Sr. and an infant sister. A service celebrating her life will be held on Saturday, February 16 at 10:30 AM at the Shanks Church of the Brethren near Greencastle, PA with Pastor Nelson H. Witmer officiating. Burial will be in the adjoining church cemetery. There will be no viewing or visitation. In lieu of flowers, memorial contributions may be made to the Shanks Church of the Brethren Trustee Fund, 992 Shanks Church Rd, Greencastle, or to the local humane society of one’s choice. Arrangements were handled by the Harold M. Zimmerman And Son Funeral Home of Greencastle. Online condolences may be sent to www.zimmermanfh.com.